Welcome to the first of our new blogs; we will be posting these once a week alongside our regular company updates. These posts will vary, some will be aimed at job seekers, some at employers and others will be a more light hearted take on a common recruitment situation, such as interviews. We hope that you enjoy them and find the advice useful; we will be posting on all of our social media platforms, so keep your eyes peeled to never miss an update! The job market is more competitive than ever. The widespread use of online job boards mean that employers are receiving more CVs than ever before. With this increased competition, it can be very disappointing to hear that perhaps you haven’t even been invited for an interview. It is therefore crucial that your CV stands out, for all the right reasons! Your CV, along with a cover letter or email, is the very first opportunity you have to market yourself to the potential recruiter. Statistics show that recruiters may spend as little as 6 seconds reviewing each CV they receive, so you need to make the right impression. Firstly, it is important to remember that the main aim of a CV is to generate enough interest to secure you an interview. Keep it punchy and to the point; avoid using any elaborate templates, graphics or unusual fonts so at first glance it looks clean and easy on the eye. Do not fall into the trap of continually adding your most recent job to the same document. As your career evolves, remove out of date or irrelevant information. For example, is it really necessary to include that newspaper round you had whilst you were at school? Or do you really need to list every single subject and grade achieved at school? 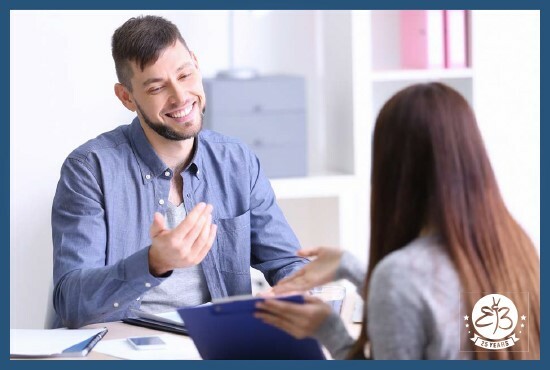 Here at Ambitions Personnel, whilst we don’t offer a CV writing service, our consultants know what a good CV looks like and can offer you hints, tips and guidance in order to ensure you secure the job you deserve. Your CV should do you justice, so take enough space to ‘sell’ yourself; employers are interested to read about any of your key achievements and success. Think about what sets you apart from the rest! Remember your CV may be the last one of the day – make it the best one! Today we’re in the Embassy Theatre, Skegness for their annual job fair! It’s a great opportunity for people in the area to meet us and see the variety of roles we have available. The team from our Boston office will be there from 10:30-14:30. The event is organised by East Lindsey District Council and the Lincolnshire Job Centre, so there will be an array of local businesses, making it incredibly useful for everyone attending. We have plenty of job fairs coming up throughout the region, all the information will be on our twitter @ambitionsltd (https://twitter.com/ambitionsltd); and if you want to browse our most recent openings head to our new @ambitionsjobs feed (https://twitter.com/ambitionsjobs). Calling all job seekers in Lincoln! 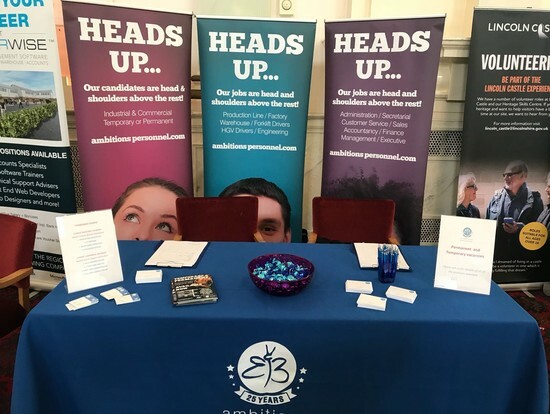 We are taking part in Lincoln Jobs Fair which is being held today at the County Assembly Rooms on the Bailgate in Lincoln. The event is open from 10:30am and runs until 14:30pm today, Friday 16th February 2018. We’ll be joined by many other local businesses and training providers so there’s sure to be an opportunity to suit everyone. 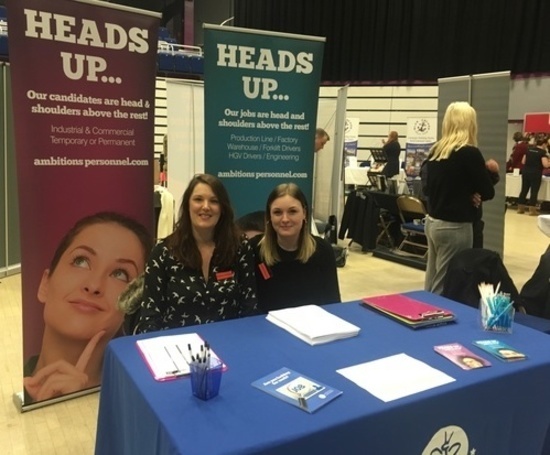 If you miss us today, don’t worry, we’ll also be the Lincolnshire Echo Jobs Fair on Wednesday 26th April being held at the Engine Shed in Lincoln. We know, it’s February, and there’s still 321 days to go until Christmas, but we wanted to share this shiny new certificate we received in the post today from the lovely people over at Save the Children UK! 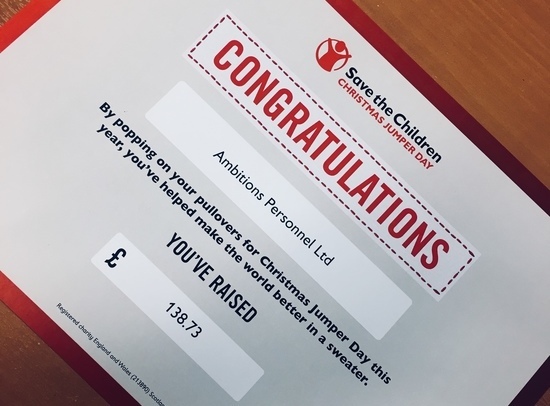 We’re proud of Team Ambitions for raising £138.73 through sponsorship and donations for Christmas Jumper Day back in December 2017. Apparently, we’re a bunch of ‘Woolly Wonders’!